CWMS Modeling of the Bighorn River Basin (MT, WY) | WEST Consultants, Inc. The Bighorn River begins as the Wind River in the Rocky Mountains and becomes the Bighorn River at the Wedding of the Waters five miles south of Thermopolis, Wyoming. The river flows 485 miles north through Boysen and Yellowtail Reservoirs before joining the Yellowstone River in Montana. WEST Consultants was contracted by the U.S. Army Corps of Engineers (USACE) Modeling Mapping and Consequences (MMC) program to develop a fully functional Corps Water Management System (CWMS) model of the 22,000-square mile Bighorn River basin. 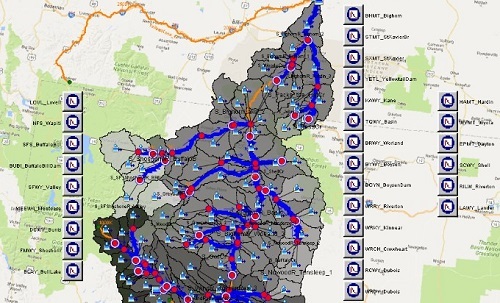 The CWMS model was developed to enhance the Corps’ ability to make informed, near real-time operational decisions for two Bureau of Reclamation reservoirs in the basin. Boysen Dam in Wyoming and Yellowtail Dam in Montana are Section 7, Bureau of Reclamation facilities operated by the Corps when pool elevation is in the flood control zone. The components of the CWMS model enable USACE to retrieve real-time hydrometerological data informing hydrologic modeling using HEC-HMS, hydraulic modeling in HEC-RAS, operations with HEC-ResSim, and operational scenario outcomes in HEC-FIA (Flood Impact Analysis). The Scope of Work included a three-day site visit to the basin, development and calibration of HMS and RAS models and CAVI (Control And Visualization Interface) integration of the suite of CWMS models. The HMS model contained 112 subbasins and 31 stream gages for calibration. Calibration was conducted for two rainfall events and three rain-on-snow events using gridded, hourly precipitation, temperature and snow water content data. The HEC-RAS model flow input came from HMS output. The unsteady HEC-RAS model was composed of two reaches: downstream of Boysen Reservoir and downstream of Yellowtail Reservoir. Additionally, WEST developed ResSim and FIA models including custom scripting for operational and data retrieval requirements. Product delivery included sample inundation maps based on high flow events, completed documentation and model reports, addressal of review comments at each milestone and travel to the District upon project completion for personnel training and model integration into the USACE database.